Sodium is vital not only for maintaining fluid balance but also for many other essential functions. In contrast to many minerals, sodium absorption in the small intestine is extremely efficient and in a healthy individual all excess sodium is excreted by the kidneys. In fact, very little sodium is required in the diet (about 200 milligrams) because the kidneys actively reabsorb sodium. Kidney reabsorption of sodium is hormonally controlled, allowing for a relatively constant sodium concentration in the blood. The second notable function of sodium is in nerve impulse transmission. Nerve impulse transmission results from the transport of sodium cations into a nerve cell, which creates a charge difference (or voltage) between the nerve cell and its extracellular environment. Similar to how a current moves along a wire, a sodium current moves along a nerve cell. Stimulating a muscle contraction also involves the movement of sodium ions as well as other ion movements. Sodium is essential for nutrient absorption in the small intestine and also for nutrient reabsorption in the kidney. Amino acids, glucose and water must make their way from the small intestine to the blood. To do so, they pass through intestinal cells on their way to the blood. The transport of nutrients through intestinal cells is facilitated by the sodium-potassium pump, which by moving sodium out of the cell, creates a higher sodium concentration outside of the cell (requiring ATP). Sweating is a homeostatic mechanism for maintaining body temperature, which influences fluid and electrolyte balance. Sweat is mostly water but also contains some electrolytes, mostly sodium and chloride. Under normal environmental conditions (i.e., not hot, humid days) water and sodium loss through sweat is negligible, but is highly variable among individuals. It is estimated that sixty minutes of high-intensity physical activity, like playing a game of tennis, can produce approximately one liter of sweat; however the amount of sweat produced is highly dependent on environmental conditions. A liter of sweat typically contains between 1 and 2 grams of sodium and therefore exercising for multiple hours can result in a high amount of sodium loss in some people. Additionally, hard labor can produce substantial sodium loss through sweat. In either case, the lost sodium is easily replaced in the next snack or meal. Hyponatremia in endurance athletes (such as marathon runners) can be avoided by drinking the correct amount of water, which is about 1 cup every twenty minutes during the event. Sports drinks are better at restoring fluid and blood-glucose levels than replacing electrolytes. During an endurance event you would be better off drinking water and eating an energy bar that contains sugars, proteins, and electrolytes. The American College of Sports Medicine suggests if you are exercising for longer than one hour you eat one high carbohydrate (25–40 grams) per hour of exercise along with ample water. Watch out for the fat content, as sometimes energy bars contain a hefty dose. If you’re not exercising over an hour at high intensity, you can skip the sports drinks, but not the water. For those who do not exercise or do so at low to moderate intensity, sports drinks are another source of extra calories, sugar, and salt. The IOM has set an AI level for sodium for healthy adults between the ages of nineteen and fifty at 1,500 milligrams (Table 3.2 “Dietary Reference Intakes for Sodium”). Table salt is approximately 40 percent sodium and 60 percent chloride. As a reference point, only ⅔ teaspoon of salt is needed in the diet to meet the AI for sodium. The AI takes into account the amount of sodium lost in sweat during recommended physical activity levels and additionally provides for the sufficient intake of other nutrients, such as chloride.The Tolerable Upper Intake Level (UL) for sodium is 2,300 milligrams per day for adults. (Just over 1 teaspoon of salt contains the 2,300 milligrams of sodium recommended). The UL is considered appropriate for healthy individuals but not those with hypertension (high blood pressure). The IOM estimates that greater than 95 percent of men and 75 percent of women in America consume salt in excess of the UL. Many scientific studies demonstrate that reducing salt intake prevents hypertension, is helpful in reducing blood pressure after hypertension is diagnosed, and reduces the risk for cardiovascular disease. The IOM recommends that people over fifty, African Americans, diabetics, and those with chronic kidney disease should consume no more than 1,500 milligrams of sodium per day. The American Heart Association (AHA) states that all Americans, not just those listed, should consume less than 1,500 milligrams of sodium per day to prevent cardiovascular disease. The AHA recommends this because millions of people have risk factors for hypertension and there is scientific evidence supporting that lower-sodium diets are preventive against hypertension. Most sodium in the typical American diet comes from processed and prepared foods. Manufacturers add salt to foods to improve texture and flavor, and also as a preservative. 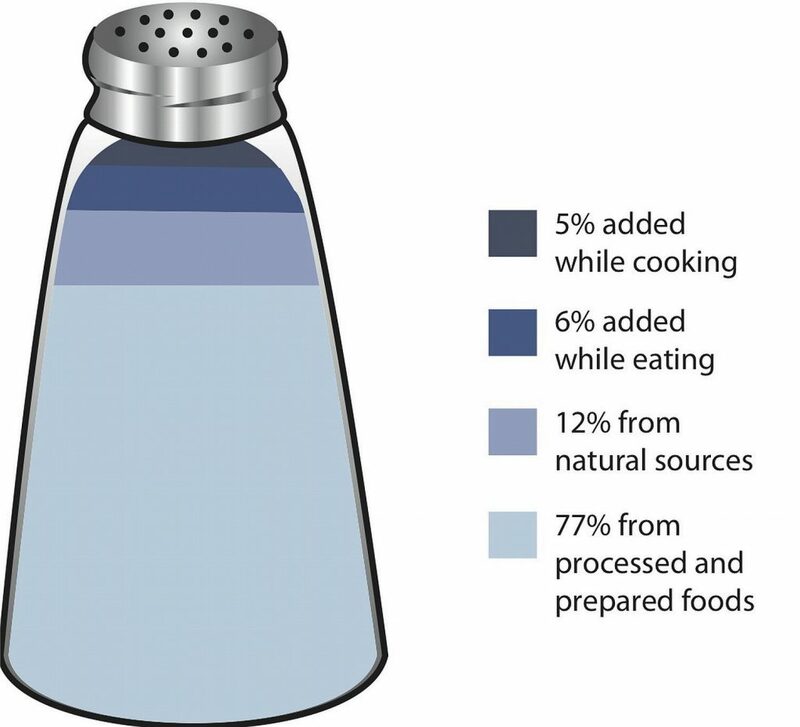 The amount of salt in similar food products varies widely. Some foods, such as meat, poultry, and dairy foods, contain naturally-occurring sodium. For example, one cup of low-fat milk contains 107 milligrams of sodium. Naturally-occurring sodium accounts for less than 12 percent of dietary intake in a typical diet. For the sodium contents of various foods see Table 3.3 “Sodium Contents of Selected Foods”. Sodium levels in milligrams is a required listing on a Nutrition Facts label. 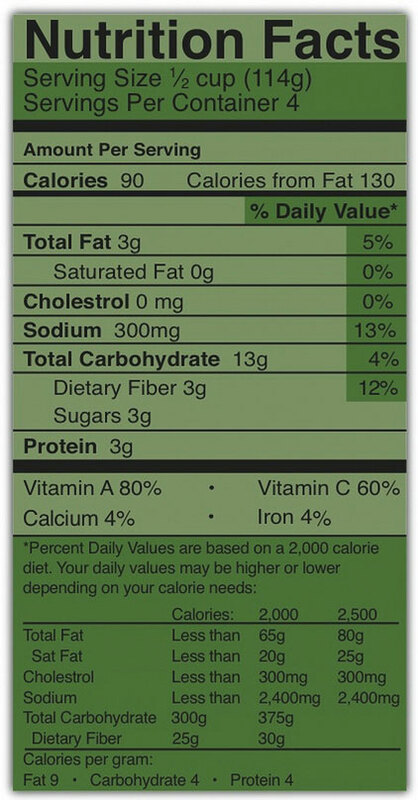 The Nutrition Facts panel displays the amount of sodium (in milligrams) per serving of the food in question (Figure 3.10 “Nutrition Label” ). Food additives are often high in sodium, for example, monosodium glutamate (MSG) contains 12 percent sodium. Additionally, baking soda, baking powder, disodium phosphate, sodium alginate, and sodium nitrate or nitrite contain a significant proportion of sodium as well. When you see a food’s Nutrition Facts label, you can check the ingredients list to identify the source of the added sodium. Various claims about the sodium content in foods must be in accordance with Food and Drug Administration (FDA) regulations (Table 3.4 “Food Packaging Claims Regarding Sodium”). Source: Food Labeling Guide. US Food and Drug Administration. http://www.fda.gov/Food/GuidanceComplianceRegulatoryInformation/GuidanceDocuments/FoodLabelingNutrition/FoodLabelingGuide/ucm064911.htm. Updated October 2009. Accessed October 2, 2011. For those with hypertension or those looking for a way to decrease salt use, using a salt substitute for food preparation is one option. However, many salt substitutes still contain sodium, just in lesser amounts than table salt. Also, remember that most salt in the diet is not from table-salt use, but from processed foods. Salt substitutes often replace the sodium with potassium. People with kidney disorders often have problems getting rid of excess potassium in the diet and are advised to avoid salt substitutes containing potassium. People with liver disorders should also avoid salt substitutes containing potassium because their treatment is often accompanied by potassium dysregulation. Table 3.5 “Salt Substitutes” displays the sodium and potassium amounts in some salt substitutes. Source: Health Facts for You: Guidelines for a Low Sodium Diet. University of Wisconsin Hospitals and Clinics Authority. http://www.uhs.wisc.edu/health-topics/nutrition-fitness-and-heart-health/documents/Sodium.pdf. Updated March 2011. Accessed September 22, 2017. Table salt may seem an essential ingredient of good food, but there are others that provide alternative taste and zest to your foods. See Table 3.6 “Salt Alternatives” for an AHA list of alternative food seasonings. Source: Shaking the Salt Habit. American Heart Association. http://www.heart.org/HEARTORG/Conditions/HighBloodPressure/PreventionTreatmentofHighBloodPressure/Shaking-the-Salt-Habit_UCM_303241_Article.jsp. Updated June 6, 2012. Accessed September 22, 2017. Sodium by University of Hawai’i at Mānoa Food Science and Human Nutrition Program is licensed under a Creative Commons Attribution-NonCommercial-ShareAlike 4.0 International License, except where otherwise noted.